As you may know, I love making bread. I have said these words many times on this blog. 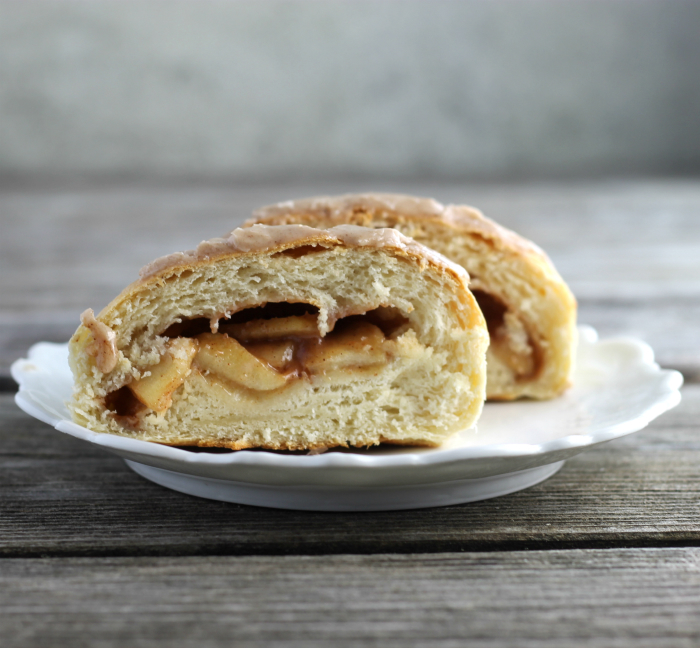 My latest creation is these apple stuffed sweet buns. If you look around my blog you will see that I have many bread recipes. There is something that I love about making bread. I am not sure if it is the fact that I love working with the dough or the smells of the yeast as I work with the dough. But I find it comforting to knead the dough and watch it transform into loaves of bread or into buns or into whatever I am making at the time. One thing I know for sure it is in my blood. The women of my family have been making bread for generations. This is not the first time that I have made stuffed buns, last summer I made blueberry stuffed buns. I have really wanted to try different versions of these buns and finally I have taken the time to do so. I made some changes to the dough this time around. So, of late I have been experimenting some with bread dough. 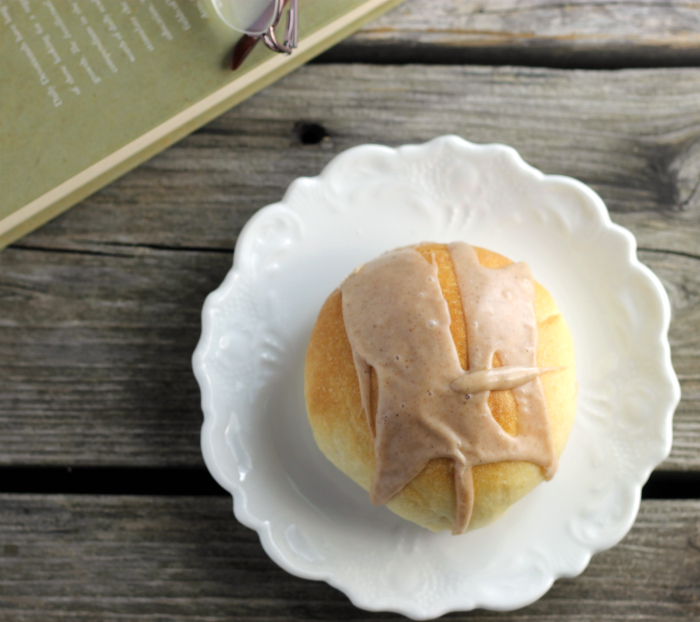 The dough for these apple stuffed sweet buns I decided to add cream cheese to it. The buns were softer than what they normally turn out to be. I have other ideas that I can’t wait to see how they turn out. As I try my ideas I am sure that I will be adding them to my blog. So I hope that you will come back and check out my new ideas. Do you like making yeast bread? 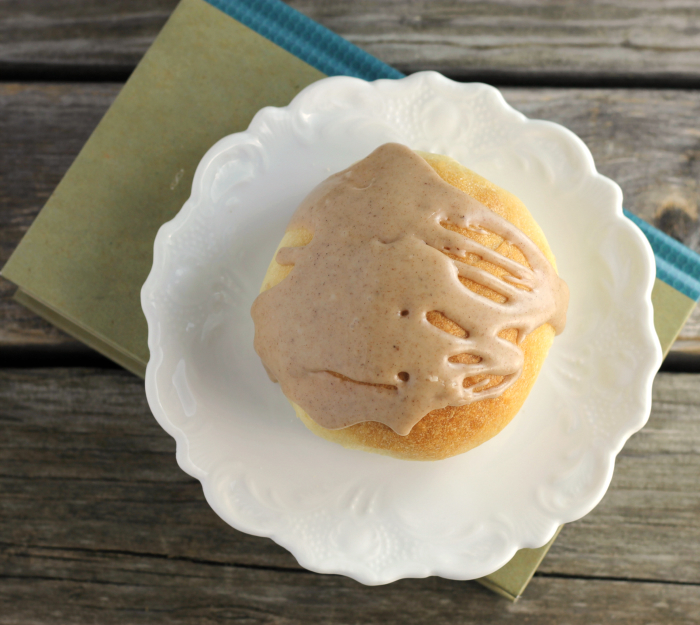 If the answer is yes, I hope you will give these apple stuffed sweet buns a try. In a large bowl combine one cup of flour, salt, and yeast, set aside. Combine the heavy cream, water, and butter, heat in the microwave to 120 to 130 degrees F.
(Cut the cream cheese into small cubes). Add the 1/2 cup brown sugar and cream cheese to the cream mixture and stir. Pour this mixture into the dry ingredients and stir with a wooden spoon until combined. Add the egg and mix in. Add one more cup of flour and mix in with a wooden spoon. Gradually add the rest of the flour, mixing and kneading by hand. You will want your dough to be slightly sticky to the touch; too much flour will make you buns dry. Grease the bottom of the pan and turn over dough to coat both sides. Cover the pan and set in a warm place. Let rise for about an 1 1/2 hours or until the dough is about double in size. While the dough is rising make your filling. Peel the apples and cut into thin slices. In a skillet add the 1/4 cup butter and heat pan. Add the 1/3 cup granulated sugar and mix in. Add the apples and flour. Cook over medium heat stirring constantly for about 10 minutes or a little more, the apples should be fork tender. Cool completely. Once the dough is double in size dived the dough into 4 equal parts. Taking one section of dough at a time, pat it out into a 8 by 8-inch square. Cut into four equal squares, you should end up with sixteen squares. Divide the apple filling between the sixteen square, about 1 tablespoon on each square. Bring the corners of the squares up over the filling and pinch together. Place the pinched side down on a greased baking sheet about 2-inches apart. Preheat oven to 375 degrees F. Once the buns have rested for 30 minutes place in the preheated oven, bake for 12 to 14 minutes or until the buns are browned over <g class="gr_ gr_256 gr-alert gr_gramm gr_disable_anim_appear undefined Grammar only-ins doubleReplace replaceWithoutSep" id="256" data-gr-id="256">top</g>. While the buns are cooling mix the icing. Add the 2 1/4 cup of powdered sugar and cinnamon to a small bowl and combine. Gradually add enough milk to make an icing that is the right consistency for drizzling over the buns. These buns can be frozen. What a fun idea to add a bit of cream cheese into the dough itself! I’m a huge fan of baking breads, but I haven’t had time lately to bake much…it could have something to do with a certain little infant in our house. Haha. 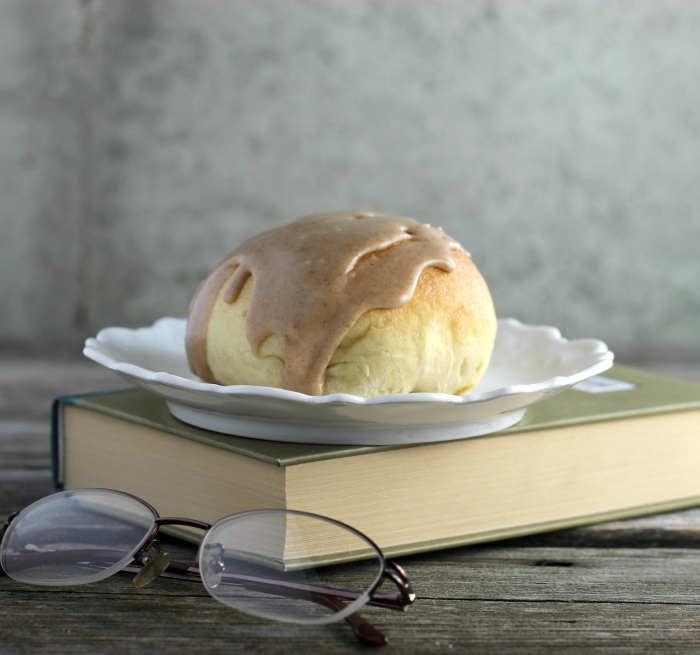 I’m thinking I should get back into the game with a batch of these apple buns! Baking bread is great, isn’t it? Love the flavor of what we bake! This looks terrific — love the apple. And the cream cheese is a nifty idea. Inspired stuff — thanks. So interesting adding cream cheese to the bread dough…something that I must try in the future. The buns look great Dawn…love the apple filling. These buns are magnificent! I have a weak spot when it comes to apple treats—I know I’d love these beauties!! These sweet buns look fantastic! I love the apple filling.